Mieko Martha Hirano was born in Tokyo. Since she was at High School, she has been learning various kinds of Floral Arrangement. Therefore her career as a Floral Artist is more than 35 years. Certified Floral Arrangement Instructor authorized by FDA (Flower Decorators Association, Tokyo Japan). 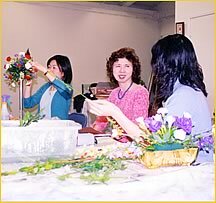 Certified Japanese IKEBANA Instructor authorized by Yanagi Koryu School. Certified Instructor of Japanese Tea Ceremony authorized by Omote Senke Seiha School. 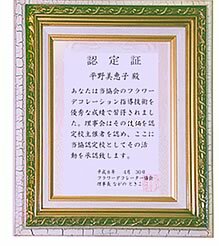 Certified Instructor and First Class Examiner of Japanese KIMONO wearing manner authorized by Japan KIMONO Association Naganuma Shizu KIMONO School. While she is running CFAA (California Flower Art Academy) in San Francisco Bay Area (Silicon Valley), she is operating NASBAC (Division of CFAA: North American Shadow Box Academy California). She took the lecture by Ms. Virginia Farewell, Ms. Louis Hillis (AIFD) and Mr. Dries Alterts (International Education Center in Netherlands). She holds various kinds of seminars and shows in San Francisco Bay Area as well as in Japan from time to time.